June is men’s health month in the US. This month is dedicated to raising awareness about common oral and overall health concerns that affect men, especially those that are often overlooked. 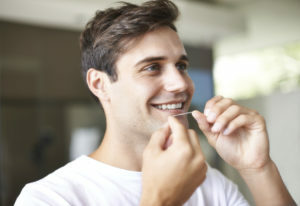 When it comes to dental care, research indicates that men are much less likely to keep up with their regular oral hygiene routines and preventive dental checkups. This puts them at increased risk for oral health issues that can negatively impact every aspect of their day to day life from the simplest smile to eating a healthy diet. What Can Men do Differently? South Daytona dentist, Sean Bannan, DDS, knows the importance of maintaining the optimal level of oral health for men and women of all ages. Whether you’re looking to improve your oral health or just need a dental practice home for all of your dentistry needs, give the Water’s Edge Dental team a call today. We will be happy to answer questions or schedule an appointment for you to sit down with Dr. Bannan to discuss your dental health care goals. It’s never too late to start creating the healthy, beautiful smile you deserve.